In the past few years I’ve tested a number of good flat-screen televisions. I’ve played with a projector/screen combination, 42-inch and 50-inch plasmas and even a 17-inch LCD computer monitor/television combination. The projector needed a darkened room to look its best. The two plasmas, after careful adjustments, looked very good. My biggest problem, however, was I always needed a neighbor to help me to lift them or even move them slightly. The 17-inch model was used as a PC display for awhile -– and then I purchased it after trying it as a replacement for a 25-inch picture-tubed monster in my bedroom. I’ve been using it for two years—but not anymore. For the past few weeks I’ve been living with Sharp’s current largest LCD, the 37-inch LC-37HV4U. I've previously passed on Sharp’s smaller sets: They’re nice, but I have a standard-definition LCD TV and I wanted to wait for a big screen model capable of delivering a high definition picture. As far as watching TV, exactly what you want to do with a TV, the Sharp has changed my life. 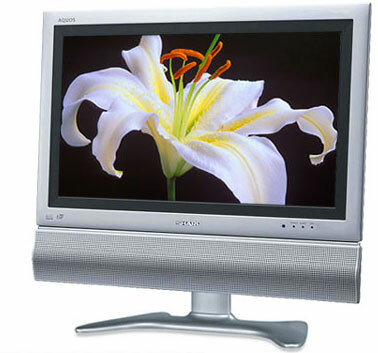 The LC-37HV4U is one great television. According to some experts it may not be 100-percent perfect, but it’s the best unit I’ve ever had in my home. I decided to replace my 17-inch LCD with the Sharp during testing. A 37-inch TV may sound like overkill in a bedroom — and it probably is. Sharp’s 30-inch is cheaper and would probably be nearly as satisfying. But, for the moment—I’m enjoying the moment. The TV itself weighs just under 40 pounds. With the table stand and side speakers attached (47 x 27 x 12 inches) it weighs 56 pounds. Those speakers are kind of heavy, as you’ll find out when you have to attach them while setting up the unit for the first time. It doesn’t matter; it’s still nearly half the weight of a comparable flat-screen plasma set. A wall mounting bracket is optional. The LC-37HV4U comes with a separate box (AVC system) for all connections. That minimizes the wires that you have to plug into the back of the TV down to two (one signal cable, one power cord). The separate box has inputs and outputs galore: 4 RCA composite, 4 S-Video, 2 HD component, 1 DVI and a PC input along with a S-video output and all sorts of audio ins and outs. Color temperature is adjustable along with view modes (stretch, zoom, normal, etc.) and all the usual TV settings (they may have fancy names these days but they’re still brightness, contrast, color, tint, sharpness) via one of the best-looking control panels I’ve ever had the pleasure to use. Lamp life is rated at 60,000 hours, which is something like twice what you’ll get out of a plasma screen. Plus, when the screen finally does go, the Sharp people tell me that replacing one bulb inside is all it will take to bring the set back to life. What they also told me was that the picture is terrific. They weren’t lying. I think this set produces one of the best pictures I’ve seen anywhere. I know that some experts say it can’t produce the blackest blacks like some larger TV’s, but I tried watching a number of dark DVDs and I was never disappointed. My HDTV viewing is limited by what Time-Warner provides on the cable box. That means HBO, Showtime, Discovery, plus local ABC, CBS, NBC, Fox and PBS feeds. When the signal quality is good, the Sharp produces very good pictures. When the picture quality is great, the Sharp is capable of providing superb quality pictures. I can tell you that news anchor people should see themselves on HDTV before they have anyone apply makeup on their faces. Bad makeup comes across looking like a surrealistic painting. It’s scary. So is watching live boxing on a HDTV. What comes across as a pink blur on a regular set is quite clearly blood spattering all over the place (at least in one match I watched). You can even see a boxer’s skin change color when being hit. On the other hand, other live events and movies are just fantastic. It’s interesting to see which prime-time programs are shot and broadcast in the 16:9 format. Believe it or not, you'll find yourself favoring them when you have a 16:9 television. The biggest surprise was the audio quality. Wow! In other flat-screen TVs I’ve seen and played with the sound was a mere afterthought. Not on the LC-37HV4U. The speakers actually add to the experience: providing deep bass, clear voices and natural treble sounds (like cymbals). What I can’t believe is that Sharp claims they have another 37-inch LCD that sounds even better. Their LC-37HV6U comes with Sharp’s 1-bit digital audio system. I’m going to have to hear that one to believe it. When it comes to price, the good news is that LCD TV prices are coming down. The bad news is that the LC-37HV4U still ain’t cheap. List price is $6,500 and I’ve seen prices on the Web about a grand less than that. If you can spend that kind of money on a flat-screen you really owe it to yourself to see this baby in action. As I said, this is the first HDTV I’m going to purchase for my own home. One final thought, with their new LCD factory coming up to speed, expect Sharp to produce larger TVs in the near future. Expect a 45-inch Sharp HDTV (capable of reproducing a full 1080 progressive picture). Also expect it to come with a suggested retail price of around $10,000. Let’s hope prices keep continuing to fall.